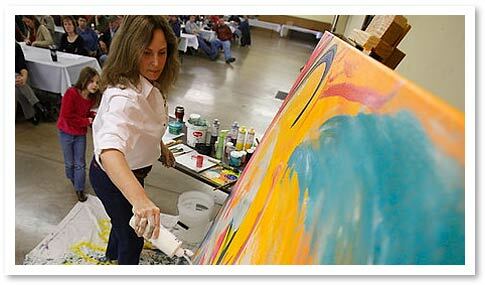 In addition to creating art in her studio, Deb Schlouch also creates abstract art at Painting the Experience events. Painting the Experience emerged after brainstorming with her husband and together they came up with the idea of painting while being inspired by an event or speaker. Deb and Barry (her husband) began speaking together for different groups – Barry as the presenter while Deb “painted” each experience. Their results were nothing short of amazing. The original works of art inspired by each event are so moving, that at the end of each presentation an extraordinary painting emerges that documents the energy and emotion of the event, and continues to inspire all who view it! Please contact Deb at 484.256.4339 or deb@debschlouch.com to discuss your upcoming event, fees, and to schedule a studio visit.